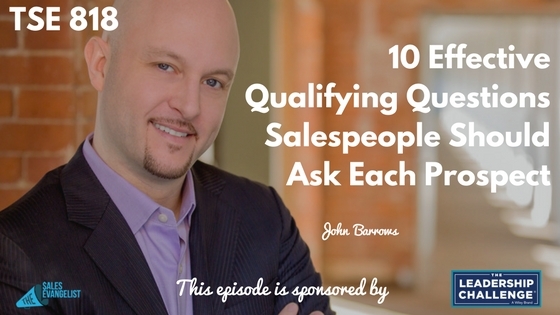 TSE 818: John Barrows "Qualifying"
Qualifying represents a vital piece of the sales process. Qualifying is perhaps the most underserved part of the process, and most of us are doing it wrong. Truth is, it doesn’t matter how well you close if you don’t have a good pipeline. On today’s episode of The Sales Evangelist, we’ll talk to John Barrows about the important questions you should be asking during qualification, and why being direct with your prospects will save you time. Everyone in sales understands that quality is important. We don’t spam. We don’t make generic phone calls. Still, though, we have daily numbers we have to reach like 50 phone calls or 100 emails. We want quality, but time is our challenge. Many of us sprinkle phone calls and emails throughout the day, but doing so is a complete waste of time. Instead, tier your accounts. Organize them by industry and call similar accounts in a single day. Doing so allows you to craft a message specific to that group, find a case study you can refer to if necessary, and prepare a few questions that are relevant to those prospects. It streamlines the calls and allows you to be more targeted and relevant in your communication. Realistically, not all of our leads deserve the same amount of our time. 1. What are the details of the decision-making process? Without understanding the full buying process, you won’t know how to proceed. Ask how these decisions have historically been made, or ask about the next steps in the process. 2. Are you ok telling me no? Most people are very uncomfortable saying no. Allow silence while you wait for an answer. If your prospect suddenly goes dark later on, you can remind him in a voicemail or email that he said he was comfortable telling you no, which will usually bring him back to the table. 3. Do you have your calendar in front of you? This question works well when a prospect asks you to send him information. Very often, that’s a blow-off move, but you can follow up by asking what information they’d like to see. If your prospect is legitimately interested, the questions will be easy to answer. Again, allow the silence that will likely happen. There’s a huge difference between being direct and being rude. Being direct gets you to “no” faster if that’s where you’re ultimately headed anyway. The more direct you are, the more quickly you’ll get them in or out. It’s a matter of setting expectations and then being accountable to them. Note, too, that the Rule of Reciprocity says that if we have just spent time on the phone providing value to a prospect, there’s a fleeting moment in which he will feel obligated to do something in return. Take advantage of that moment. Here’s John’s full list of 10 Sales Qualification Questions To Always Ask Your Prospect. What are the details of the decision making process and who is involved? How have decisions like this been made in the past? What are your top business priorities for the upcoming year? What are your top priorities when making this decision? Are you okay with telling me no? What’s the best way to communicate with you moving forward? Will you be my Champion? What happens if this decision doesn’t get made? Do you have your calendar in front of you? Based on today’s conversation, do you think our solution would add value to your business? Connect with John at his website, where you can find links to his social media as well as his LinkedIn. 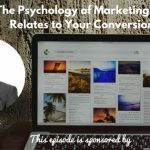 Share this podcast with others who want to learn more about qualifying leads. 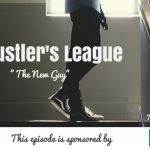 Leave us a review wherever you consume the content, and subscribe if you haven’t already. Check out The Sales Evangelizers on Facebook to connect with sellers of all levels in a variety of industries.